This document describes Modality Components in the MMI Architecture which are responsible for controlling the various input and output modalities on various devices by providing guidelines and suggestions for designing Modality Components. Also this document shows several possible examples of Modality Components, (1) face identification, (2) form-filling using handwriting recognition and (3) video display. This is the 1 March 2011 W3C Working Group Note of "Best practices for creating MMI Modality Components". The Multimodal Interaction Working Group once published a Working Draft of the "Multimodal Architecture and Interfaces (MMI Architecture)" on 16 October 2008 with this content. However, the Working Group concluded that the description on how to create Modality Components and examples of possible Modality Components should be published as a Working Group Note rather than part of the MMI Architecture specification. The goal of this Working Group Note is to provide guidelines and suggestions for designing Modality Components in the MMI Architecture and make it easier to author concrete Modality Components for multimodal Web applications. Also this document shows several possible examples of Modality Components, (1) face identification, (2) form-filling using handwriting recognition and (3) video display. This W3C Working Group Note has been developed by the Multimodal Interaction Working Group of the W3C Multimodal Interaction Activity. Comments for this note are welcomed and should have a subject starting with the prefix '[ARCH]'. Please send them to www-multimodal@w3.org, the public email list for issues related to Multimodal. This list is archived and acceptance of this archiving policy is requested automatically upon first post. To subscribe to this list send an email to www-multimodal-request@w3.org with the word "subscribe" in the subject line. 2.1 Guideline 1: Each modality component must implement all of the MMI life-cycle events. 2.2 Guideline 2: Identify other functions of the modality component that are relevant to the interaction manager. 2.3 Guideline 3: If the component uses media, specify the media format. For example, audio formats for speech recognition, or InkML for handwriting recognition. 2.4 Guideline 4: Specify protocols for use between the component and the Interaction Manager (IM) (e.g., SIP or HTTP). 2.5 Guideline 5: Specify supported human languages, e.g., English, German, Chinese and locale, if relevant. 2.6 Guideline 6: Specify supporting languages required by the component, if any. 2.7 Guideline 7: Modality components sending data to the interaction manager must use the format where appropriate. 2.8 Guideline 8: Specify error codes and their meanings to be returned to the IM. 3.1 Design suggestion 1: Consider constructing a complex modality component with multiple functions if one function handles the errors generated by another function. 3.2 Design suggestion 2: Consider constructing a complex modality component with multiple functions rather than several simple modality components if the functions need to be synchronized. 3.3 Design suggestion 3: Consider constructing a nested modality component with multiple child modality components if the children modality components are frequently used together but do not handle ther errors generated by the other children components and the children components do not need to be extensively synchronized. The W3C Multimodal Interaction (MMI) Working Group develops an architecture [MMI-ARCH] for the Multimodal Interaction framework [MMIF]. The Multimodal Architecture describes a general and flexible framework for interoperability of the various components of the multimodal framework (e.g. modality components (MC) and the interaction manager (IM)) in an abstract way. Among others it defines interfaces and messages between the constituents of the framework, but it is up to the implementation to decide how these messages are transferred in case of a distributed implementation. The following guidelines guarantee that modalities are portable from interaction manager to interaction manager. The MMI life-cycle events are the mechanism through which a modality component communicates with the interaction manager. The Modality Component (MC) author must define how the modality component will respond to each life-cycle event. A modality component must respond to every life-cycle event it receives from the interaction manager in the cases where a response is required, as defined by the MMI Architecture. For example, if a modality component presents a static display, it must respond to a <pause> event with a <pauseResponse> event even if the static display modality component does nothing else in response to the <pause> event. For each life-cycle event, define the parameters and syntax of the "data" element of the corresponding the life-cycle event that will be used in performing that function. For example, the <startRequest> event for a speech recognition modality component might include parameters like timeout, confidence threshold, max n-best, and grammar. Define an <extensionNotification> event to communicate these functions to and from the interaction manager. 2.7 Guideline 7: Modality components sending data to the interaction manager must use the [EMMA] format where appropriate. If a modality component captures or generates information, then it should format the information using the EMMA format and use an extension event to send that information to the interaction manager. The MC developer must specify all error codes that are specific to the component. If the MC is based on another technology, the developer can provide a reference to that technology specification. For instance, if the MC is based on VoiceXML, a reference to the VoiceXML spec for VoiceXML errors can be included instead of listing each VoiceXML error. Errors such as XML errors and MMI protocol errors must be handled in accordance with the guidelines laid out in the MMI architecture. These errors do not need to be documented. The following design suggestions should be helpful for modality component authors to make modalities portable from interaction manager to interaction manager. For example, if the ASR fails to recognize a user's utterance, a prompt may be presented to the user asking the user to try again by the TTS function. As another example, if the ASR fails to recognize a user's utterance, a GUI function might display the n-best list on a screen so the user can select the desired word. Efficiency concerns may indicate that two modality components be combined into a single complex modality component. For example, a TTS function must be synchronized with a visual talking head so that the lip movements are synchronized with the words. As another example, a TTS functions presents information about the each graphical item that the user places "in focus." Again, efficiency concerns may indicate that the TTS and talking head be two modality components be combined into a single complex modality component. Writing an application using a nested modality component may be easier than writing the same application using multiple modality components if the nested modality component hides much of the complexity of managing the children modality components. Consider a theoretical face identification modality component that takes an image or images of a face and returns the set of possible matches and the confidence of the face identification software in each match. An API to that modality component would include events for starting the component, providing data, and for receiving results back from the component. This particular example includes the information needed to run this component in the "startRequest" and "doneNotification" events; that is, in this example no "extensionNotification" events are used, although extensionNotification events could be part of another modality component's API. This example assumes that an image has already been acquired from some source; however, another possibility would be to also include image acquisition in the operation of the component. Depending on the capabilities of the modality component, other possible information that might be included would be some useful non-functional information as the capturing context of the still picture (e.g. indoor picture or outdoor picture) or the type of image (e.g. a portrait photography or a street photography) or would be some technical information as the algorithm to be used or the image format to expect. We emphasize that this is just an example to indicate the kinds of information that might be used by a multimodal application that includes face recognition. The actual interface used in real applications should be defined by experts in the field. The use case is a face identification component that identifies one of a set of employees on the basis of face images. The MMI Runtime Framework could use the following events to communicate with such a component. Table 1: Component behavior of Face Identification with respect to modality component guidelines. Guideline 1: Each modality component must implement all of the MMI life cycle events. See Table 2 for the details of the implementation of the life-cycle events. Guideline 2: Identify other functions of the modality component that are relevant to the interaction manager. All the functions of the component are covered in the life-cycle events, no other functions are needed. Guideline 3: If the component uses media, specify the media format. The component uses the jpeg format for images to be identified and for its image database. Guideline 4: Specify protocols supported by the component for transmitting media (e.g. SIP). The component uses HTTP for transmitting media. Guideline 5: Specify supported human languages. This component does not support any human languages. Guideline 6: Specify supporting languages required by the component. This component does not require any markup languages. Guideline 7: Modality components sending data to the interaction manager must use the EMMA format. This component uses EMMA. Table 2: Component behavior of face identification for each life-cycle event. newContextRequest (Standard) The component requests a new context from the IM. newContextResponse (Standard) The component starts a new context and assigns the new context id to it. prepareRequest The component prepares resources to be used in identification, specifically, the image database. prepareResponse (Standard) If the database of known users is not found, the error message "known users not found" is returned in the <statusInfo> element. startRequest The component starts processing if possible, using a specified image, image database, threshold, and limit on the size of nbest results to be returned. startResponse (Standard) If the database of known users is not found, the error message "known users not found" is returned in the <statusInfo> element. doneNotification Identification results in EMMA format are reported in the "data" field.The mode is "photograph", the medium is "visual", the function is "identification", and verbal is "false". cancelRequest This component stops processing when it receives a "cancelRequest". It always performs a hard stop whether or not the IM requests a hard stop. pauseRequest This component cannot pause. pauseResponse <statusInfo> field is "cannot pause". resumeRequest This component cannot resume. resumeResponse <statusInfo> field is "cannot resume". extensionNotification This component does not use "extensionNotification". It ignores any "extensionNotification" events that are sent to it by the IM. statusResponse The component returns a standard life cycle response. The "automaticUpdate" attribute is "false", because this component does not supply automatic updates. Note: "(Standard)" means that the component does not do anything over and above the actions specified by the MMI Architecture. To start the component, a startRequest event from the IM to the face identification component is sent, asking it to start an identification. It assumes that images found at a certain URI are to be identified by comparing them against a known set of employees found at another URI. The confidence threshold of the component is set to .5 and the IM requests a maximum of five possible matches. As part of support for the life-cycle events, a modality component is required to respond to a startRequest event with a startResponse event. Here's an example of a startResponse from the face identification component to the IM informing the IM that the face identification component has successfully started. Here's an example of a startResponse event from the face identification component to the IM in the case of failure, with an example failure message. In this case the failure message indicates that the known images cannot be found. Here's an example of an output event, sent from the face identification component to the IM, using EMMA to represent the identification results. Two results with different confidences are returned. This is an example of EMMA output in the case where the face image doesn't match any of the employees. Consider an ink recognition modality component for Handwriting Recognition (HWR) that takes digital ink written using an electronic pen or stylus, performs recognition and returns the recognized text. An API to such a modality component would include events for initializing the component, requesting for recognition by providing digital ink data, and for receiving recognized text result (possibly an n-best list) back from the component as shown in the below figure. This example assumes that handwriting ink is captured, represented in W3C InkML format and sent to the IM requesting for recognition to text. The following sequences of events explain the ink recognition request. The IM requests the ink recognition modality by sending the "prepareRequest" event along with the parameters for configuring the HWR system. Ink recognition modality responds with the "prepareResponse" event with the status of the configuration of the HWR system. IM sends the "startRequest" event to the ink recognition modality where the event's data field contains the InkML data to be recognized. Once the recognition is completed, the ink recognition modality notifies the results to the IM using the "doneNotification" event along with the recognition choices (N-best list). The use case is a form-filling application which accepts handwriting input provided by the user on the form fields. The inputs are recognized and displayed back as text in the corresponding fields. An ink capture modality may be used to capture the ink and send it to IM for recognition. The communication between the ink capture modality and the IM is not covered here for the sake of brevity. The below section explains the details of the communication between the MMI Runtime Framework (RTF) of the IM and the ink recognition modality. Table 3: Component behavior of Ink modality with respect to modality component guidelines. Guideline 1: Each modality component must implement all of the MMI life cycle events. See Table 4 for the details of the implementation of the life-cycle events. Guideline 3: If the component uses media, specify the media format. The component uses W3C InkML format to represent handwriting data (digital ink). Guideline 4: Specify protocols supported by the component for transmitting media (e.g. SIP). The component uses HTTP for transmitting media. Other standard protocols such as TCP may also be explored. Guideline 5: Specify supported human languages. Virtually any human language script can be supported based on the HWR component capability. Guideline 6: Specify supporting languages required by the component. W3C InkML for representing the handwriting data. Table 4: Component behavior of handwriting recognition for each life-cycle event. prepareRequest The component prepares resources to be used in recognition. Based on the 'script' parameter, it first selects an appropriate recognizer. It also configures the recognizer with other parameters such as recognition confidence threshold, limit on the size of n-best results to be returned etc., when available. prepareResponse (Standard) If the recognizer failed to find a matching recognizer for the request language script, a relevant error message is returned in the <statusInfo> element. startRequest The component performs recognition of the handwriting input. startResponse (Standard)The status of recognition as "success" or "failure" is returned in the <statusInfo> element. doneNotification Identification results in EMMA format are reported in the "data" field. The mode is "ink", the medium is "tactile", the function is "transcription", and verbal is "true". cancelRequest This component stops processing when it receives a "cancelRequest". It always performs a hard stop irrespective of the IM request. IM send a prepareRequest event to the ink recognition component. The ink recognition component selects an appropriate recognizer that matches the given language script, in this example it is set to "English_Lowercase". The "RecoGrammar.xml" grammar file contains constraints that aid the recognizer. The confidence threshold of the component is set to .7 and the IM requests a maximum of five possible matches. Based on the capability of the recognizer, other possible parameters such as a 'user profile' that contains user-specific information can be provided. As part of support for the life cycle events, a modality component is required to respond to a prepareRequest event with a prepareResponse event. Here's an example of a prepareResponse from the ink recognition component to the IM informing the IM that the ink recognition component has successfully initialized. Here's an example of a prepareResponse event from the ink recognition component to the IM in the case of failure, with an example failure message. In this case the failure message indicates that the language script is not supported. To start the component and recognize the handwriting data, a startRequest event from the IM to the ink recognition component is sent. The data field of the event contains InkML representation of the ink data. Along with the ink, additional information such as the reference co-ordinate system and capture device's resolution may also be provided in the InkML data. The below example shows that the ink strokes have X and Y channels and the ink has been captured at a resolution of 1000 DPI. 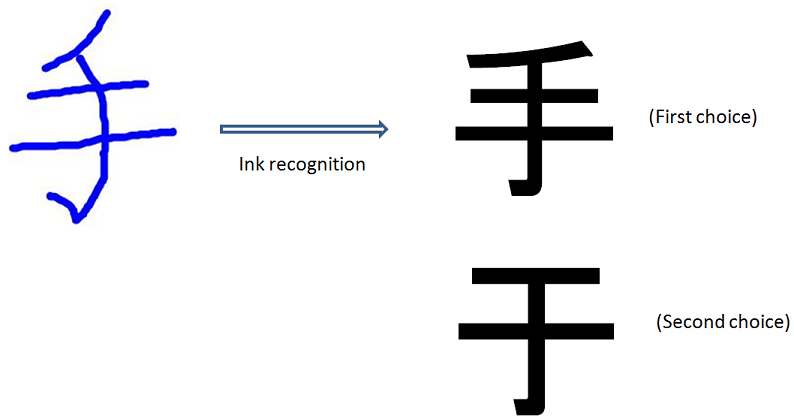 The example ink data contains strokes of the Japanese character "手" (te) which means "hand". As part of support for the life cycle events, a modality component is required to respond to a startRequest event with a startResponse event. Here's an example of a startResponse from the ink recognition component to the IM informing the IM that the ink recognition component has successfully started. Here's an example of a startResponse event from the ink recognition component to the IM in the case of failure, with an example failure message. In this case the failure message indicates that the recognition failed due to invalid data format of the handwriting data. Here's an example of an output event, sent from the ink recognition component to the IM, using EMMA to represent the identification results. Two results with different confidences are returned. This is an example of EMMA output in the case where the recognizer is unable to find a suitable match to the input handwriting. The EMMA output contains an empty interpretation result. Consider a theoretical video display modality component that receives a video file and displays it in a screen. An API to that modality component would include events for starting the component, providing the video file and for receiving player status information back from the component. This example includes the information needed to run this component in the "startRequest" event and shows a display codec problem. In order to focus in the behavior of the output modality component, this example assumes that the video file is given from some source; however, another possibility would be to also include video acquisition in a composite (input/output) and more complex real-time display component. Depending on the capabilities of the modality component, other possible information that might be included would be the video formats supported. The MMI Runtime Framework could use the following events to communicate with such a component. Table 5: Component behavior of Video Display with respect to modality component guidelines. Guideline 1: Each modality component must implement all of the MMI life cycle events. See Table 6 for the details of the implementation of the life-cycle events. Guideline 3: If the component uses media, specify the media format. The component uses for the moment only the h.264 codec format. Table 6: Component behavior of Video Display for each life-cycle event. prepareRequest The component prepares resources to be used in display configuration, specifically, the supported formats table. startRequest The component starts displaying video if possible. The <mmi:data> element might hold a <video-display-parameters> element containing a "videoFile" attribute. The "videoFile" attribute contains the URI referencing the video content. startResponse (Standard)If the current video format (WVM) is not found in the supported codec formats table, the error message "codec not supported" is returned in the <statusInfo> element. doneNotification Display state in EMMA format are reported in the "data" field. The mode is "video", the medium is "visual", the function is "playing", and verbal is "false". To start the component, a startRequest event from the IM to the display component is sent, asking it to start a video display. It gives information about a video file in a certain URI. As part of support for the life-cycle events, a modality component is required to respond to a startRequest event with a startResponse event. Here's an example of a startResponse from the display component to the IM informing the IM that the component is successfully started and video is displaying. Here's an example of a startResponse event from the display component to the IM in the case of failure, with an example failure message. In this case the failure message indicates that the video codec is not supported. "Multimodal Architecture and Interfaces (Working Draft)" , Jim Barnett et al. editors. This specification describes a loosely coupled architecture for multimodal user interfaces, which allows for co-resident and distributed implementations, and focuses on the role of markup and scripting, and the use of well defined interfaces between its constituents. World Wide Web Consortium, 2011. "Extensible multimodal Annotation markup language (EMMA)" , Michael Johnson et al. editors. EMMA is an XML format for annotating application specific interpretations of user input with information such as confidence scores, time stamps, input modality and alternative recognition hypotheses, World Wide Web Consortium, 2009. "Voice Extensible Markup Language (VoiceXML) Version 2.1" , Matt Oshry et al. editors. World Wide Web Consortium, 2007. "Speech Synthesis Markup Language (SSML) Version 1.1" , Daniel C. Burnett et al. editors. World Wide Web Consortium, 2010. "Speech Recognition Grammar Specification Version 1.0" , Andrew Hunt et al. editors. World Wide Web Consortium, 2004. "Semantic Interpretation for Speech Recognition (SISR) Version 1.0" , Luc Van Tichelen al. editors. World Wide Web Consortium, 2004.